A couple years ago, word first started to spread about a planned TV series set in the megalopolis that the ruthless keeper of the peace Judge Dredd calls home, Mega-City One. Since then, a few details have trickled out, including the fact that a pilot script has been written and two seasons’ worth of storylines have been discussed. Unfortunately for fans eager to see what misadventures will unfold in this chaotic, dystopian setting, that’s pretty much all we know. In a recent, highly-detailed explainer video, YouTube movie reviewer and Judge Dredd super-fan Mr. H set about answering the question on everyone’s mind: Is this show still happening? The shortest and most frustrating answer is: Yes, but not anytime soon. 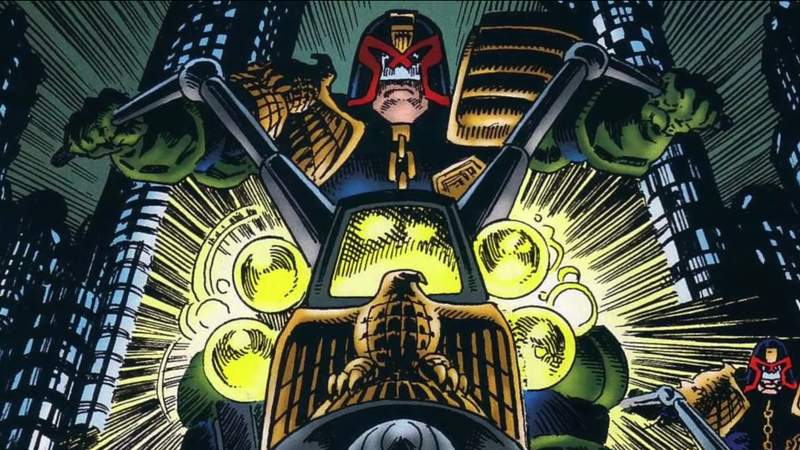 As the video explains, the Judge Dredd: Mega-City One is the brainchild of IM Global and Rebellion Productions (a UK-based video game developer who owns the rights to the original 2000 AD comic). When Rebellion CEO Jason Kinsley revealed the idea for the show—which would not be so much a sequel or prequel to the much-loved Karl Urban Dredd film, but would rather focus on an ensemble cast of characters in Mega-City One, with Dredd himself only playing a small part—fans were excited by the ambitious proposal. However, the development process for such an ambitious project is long and arduous, and this one in particular was complicated by Rebellion wanting to handle the production side of things themselves. In November of last year, Rebellion revealed to Variety that they had purchased a piece of property near Oxford, England that would function as their personal TV and film studio. Keeping all development and production duties in-house will no doubt ensure that Judge Dredd: Mega-City One is as close to the creators’ intended vision as possible, but it also means that the massive sci-fi world is in the hands of a company who’s never done something like this before. So, as Rebellion limps their way into to pre-production, we’re still no closer to knowing when this show will get made and, just as importantly, how we’ll see it once it’s done.